Apparently, a rumor is doing the rounds in the F1 paddock that Ferrari have managed to increase the power available from their V8 engine for the 2008 season. The story goes that this has given them a decisive advantage over other teams. Being anti-Ferrari, naturally I seize upon this as an explanation for the red team's current dominance, stirring into the mix my suspicions that the FIA would assist in the process by allowing Ferrari tweaks that they would stop in others. But rumor is a dubious thing to base such theories upon and so I shelve the matter until more is known. What I do find very interesting, however, is the fact that the engine freeze regulations contain such loopholes as allowing changes in the engines to solve reliability issues. We were led to believe that the engines were as good as sealed for the freeze and now it seems that is not quite the whole truth. If improvements are allowed on the grounds of reliability, it becomes a matter of opinion as to what changes are permitted and what are not. This seems to be a recurring problem with far too many FIA regulations - too much hangs upon the way some faceless official interprets the case before him. Given that suspicion exists that Ferrari receive preferential treatment from the FIA, I would have thought that the organization should be doing its utmost to ensure that the regulations are clear, precise and beyond the influence of personal interpretation. Not so, it seems. If the rumor has any factual basis at all, one would have to question there being any changes to the Ferrari engine approved at all on the pretext of solving reliability problems. In 2007, the engine was exceptionally reliable, on only one occasion (Kimi's retirement at the European GP for "mechanical reasons") where the cause might be said to be engine-related. The other two Ferrari retirements are put down to electrics (Kimi in Spain) and suspension (Massa in Italy). Such superb reliability hardly justifies any changes, particularly those that increase engine power. Okay, it's a rumor only. But it highlights a potential trouble spot in the regulations and shows up the whole idea of an engine freeze as the silly idea it is. Of course one must make allowance for fixing problems that have arisen during competition - it would be unfair to expect a team to soldier on for the next few years with an engine that self-destructs in half the races. But the moment you allow changes to be made, costs increase (thereby negating the intent of the rule) and the possibility of cheating creeps in. There is nothing to stop the engineers continuing to work on the engine, searching for increases in power, and then claiming that a change is needed "for reliability reasons". So the engine freeze becomes just one more of those debatable rules instituted by a governing body that has lost contact with reality. It has been obvious for years that the rules need to be simplified rather than made ever more complex and that new rules that do not work should be done away with. That would require the occasional admission from the officials that they were wrong and, unfortunately, they appear to be incapable of accepting their own fallibility. I seem to be saying this a lot lately but it really is time that the whole incompetent bunch were thrown out and a new start made. It's worth noting that technically the freeze only began when the engines completed a full two-race cycle - meaning that Ferrari only handed their unit over at the end of the Bahrain weekend. Any modifications before then are legal by the strict reading of the regulations. If the FIA can't be bothered to specify the exact nature of the regulations properly, it shouldn't be surprised when teams break them apart. Such a silly rule for F1 in the first place. I agree with reducing driver aids, restricting aero add ons, but not stopping technology in the engine, gearbox, and suspension areas. After all, they are supposed to be building 'unique' race cars team by team(of course, this is another gray area). They are also supposed to be the most technically advanced racing machines on earth. If Alianora is right, and we all know she is always right, it is a very silly rule by the FIA. I have no doubt that Alianora is correct in her reading of the rules (as Aracer said, she always is!) and it is true too that the other teams will have been doing what they could to circumvent the freeze via the same loophole. The problem lies in the common perception of the FIA as a body partial to Ferrari and quite likely to allow that team to effect changes to their engine that they would disallow for others. It does not really matter whether this is true or not; the perception is there and is only fed more fuel by such rumors as the one reported. Regulations should not be written in such a way as to allow for partiality. The freeze must either be a freeze (almost certainly impossible) or there should be no freeze at all. As Aracer says, it is one of the aims of F1 to produce cars on the cutting edge of technology and such things as engine freezes are inappropriate to the sport anyway. I don't have a shed of doubt about the level of bias and abuse the FIA execute on behalf of Ferrari. It's well known the FIA are over represented by Ferrari affiliates. Max and Bernie are best friends of Luca. 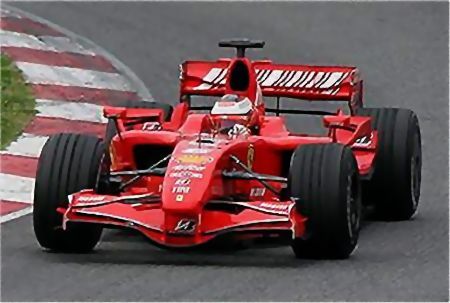 I'm 100% convinced the 2007 WDC was rigged in Ferrari's favour because it was Ferrari's 60th anniversary, and a WCC and WDC win would allow them to milk a lot of money out of the occassion. I agree, Mule - the demise of Max is the one hope for the future of F1. It will be a huge task to get things going in the right direction again, however. so what, it's there for EVERYONE, just because Ferrari was first to use it doesn't make it wrong. Quite right, Number 38 - loopholes are there to be exploited. The problem comes when the FIA behaves in such a way as to make us think they allow whatever tweak Ferrari introduce but disallow any improvement by other teams. So, for example, Ferrari's wheel covers are passed over without comment although clearly illegal, but Renault's mass dampers are banned on an obvious pretext. And it is not sufficient to point out that the other teams are now copying the inserts - it has taken over a year for the majority of them to design and implement their own versions of the tweak and, in the meantime, Ferrari enjoys an advantage through a movable aerodynamic device that should have been thrown out as soon as it appeared. There are reasons why we suspect the FIA of Ferrari bias. About your opinion in FIA biasing results to bring the maximum stash i agree. For instance those crazy rules made just for stop Schumacher winning were stupid and since he retired just brought the sport into the rule mess where it is now. Last year i don't think FIA went on to the spygate to prevent Hamilton or Mclaren from winning. That, i think, was just personal between Dennis and Mosley. There are now so many websites devoted to F1 – the majority cutting-and-pasting stories from elsewhere without further investigation – that it’s incredibly easy for an inaccurate story to be repeated often enough to be accepted as truth. And the more expert PR practitioners in the F1 paddock know it. This is a case in point. Anyone who actually followed up the engine story properly will have been told that when a team applies to the FIA to make an engine change – on whatever grounds – all the other teams are informed of those changes via an official bulletin. Trouble is, the Turkish GP was a cripplingly slow news weekend (hence, incidentally, the made-up story about Hamilton donating £15,000 to the GPDA). Having been given this piece of Ferrari “intelligence”, Auto Motor & Sport either didn’t bother to ask, or ploughed on with the story anyway in the absence of anything else to write about. After all, that quote from Mario Theissen is hardly a ringing endorsement of the story’s premise, is it? So: canny PR man has a word in the shell-like of a credulous journalist, and within a few hours a piece of utter twaddle has become gospel truth. Agreed that the number of F1-related websites seems to be increasing almost daily, Vilehackwriter - I suppose we must be encouraged that this indicates growth in the sport's popularity. I often envy the facility with words the great writers have – even when they’re conjuring a neologism. The emphasis on quotes – and, let’s face it, a lot of the F1 “news” we see day-to-day is quote-based – could ultimately prove to be problematic as we move further into the internet age. At the moment only a couple of F1 websites (by which I mean websites not affiliated to a newspaper, etc) send journalists to races; partly because of accreditation restrictions, partly because of money. It costs around £20,000 a year in travel expenses to go to all the races and even the likes of Autosport.com don’t have revenues concomitant with the size of their readership – because they struggle to get people to pay for content. Imagine how galling it must be to go to the expense of sending someone to a GP, perhaps rooting out a few exclusives, only for a bunch of bedroom plagiarists like GMM to pick up the story within 20 minutes, give it a tweak and then sell it on for a small profit. Like a sequence of badly degraded faxes, the integrity of the original story vanishes as successive copyists beat it out of shape, each trying to add a spurious air of originality. Often they’ll spin a quote totally out of context so as to create a different story altogether. Ultimately it could be that the bad news sources drive out the good: quality sites give up sending people to races because the commercial model doesn’t work. In any case, as the Guardian writer points out, quotes aren’t always worth that much, anyway. An F1 hack of my acquaintance interviewed a certain team principal at the back end of last year and asked him about budget capping. Owing to some confusion about word counts, having filed the story said hack was called upon to chop 1500 words (!) out of it. Deciding that the budget-capping issue was probably a dead duck, he culled the entire exchange. Imagine his surprise when, three months later, he read a news story in which the same team principal was backing budget caps to the hilt!